Blockbook. Woodblock print on paper, printed on one side of the sheet only. 277 x 211 mm. 37 leaves (of 40). With 37 (of 40) full-page illustrations and Latin text, with early partial colouring in yellow, brown, and red washes. The name Biblia pauperum (Pauper’s Bible) is misleading, since it was highly unlikely that it was used to teach the poor and uneducated the story of the Bible. On the contrary, the picture-text pages with their complex presentations were aimed at the literate and devout, who knew their Scripture well enough to follow the narrative content. The Biblia pauperum represents the typology of the Middle Ages. Subjects from the Life and Passion of Christ were compared to Old Testament events and provided along with a witness from the prophets. The manuscript tradition of this picture focused text goes back to the 13th century. In the forty-leaf Biblia pauperum to which the present copy belongs, the leaves are arranged into compartments with an architectural framework. The centre depicts a scene from the life of Christ and is flanked on right and left by two prefigurations from the Old Testament, above and below these panels are figures of prophets and saints. The scholar Schreiber identified a total of ten editions among the extant impressions and classified the present version as edition I. However, according to more recent research, Schreiber’s edition IV is the most likely candidate to be the editio princeps, and the group of editions I-III appears to be the second in the chronological sequence. 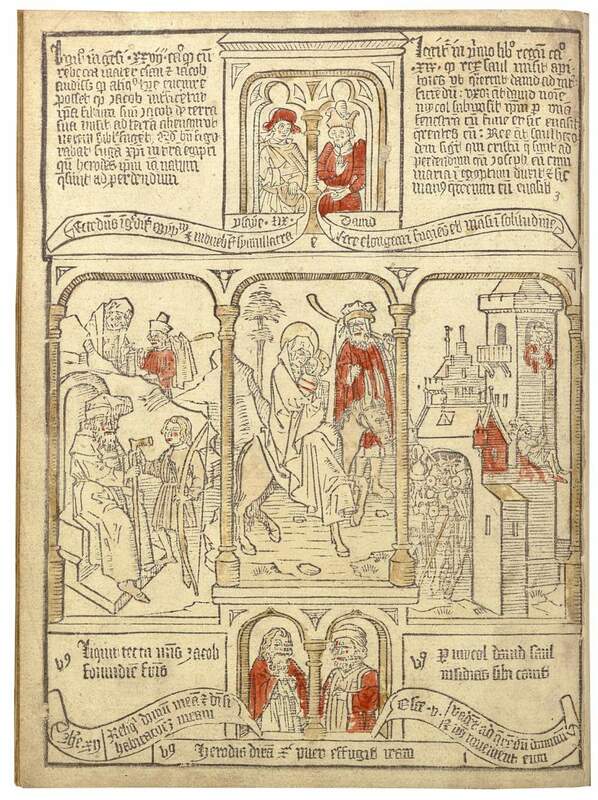 Blockbooks are characterized by a close relationship between images and explanatory texts, as both were cut and printed from the same wooden block. All blockbooks are extremely rare.